Riley Lees (left) and Cameron Ruiz celebrate against Iowa. Pat Fitzgerald has taken some ugly losses in recent years. Consider the one-two punch of Western Michigan (not so bad after all, since the Broncos went to the Cotton Bowl that year) and Illinois State (horrifyingly bad) in 2016. In 2017, Northwestern lost to Duke by 24 in a game far more lopsided, then briefly regained its footing only to barely score against Penn State. Then, of course, there was this September. First, the Wildcats suffered an inglorious home defeat to the Blue Devils. A week later, NU covered itself in shame by losing to Akron, thanks in no small part to three Clayton Thorson turnovers that ended in touchdowns. Beyond their hideousness, those losses all have one other thing in common: They meant virtually nothing. That’s the thing with Fitzgerald. His track record in routine contests is between middling and maddening. But in games with something tangible on the line, the Cats’ 13th-year man excels. 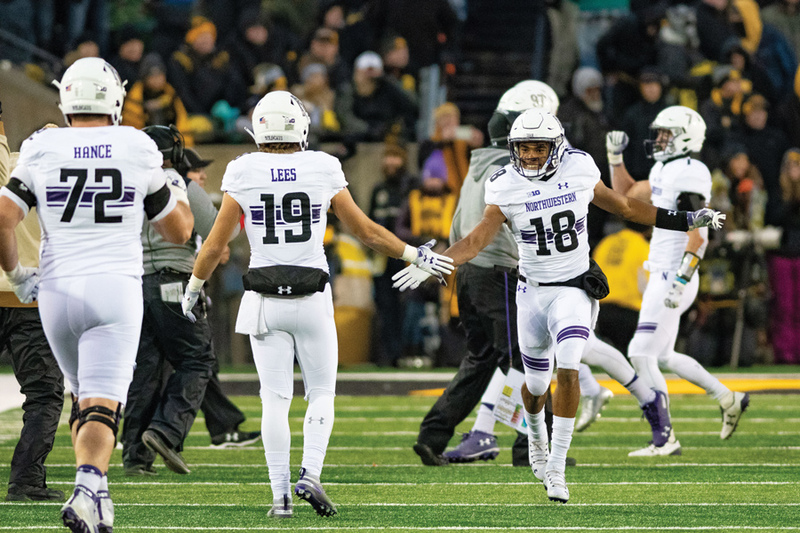 NU underscored that point last Saturday at Iowa, coming from behind in the fourth quarter to clinch its first-ever Big Ten west title — with two weeks to spare. Instead of waiting for sputtering Minnesota and Illinois, Fitzgerald and Co. took full advantage of other favorable results on Saturday, defeating the best team left on their schedule to claim victory early. With Thorson again off his game, true freshman running back Isaiah Bowser stepped up, for the fourth consecutive week, to carry the offensive load. Barely used defensive backs — like cornerback Alonzo Mayo — looked unfazed after being gashed on the Hawkeyes’ lone touchdown drive, and quickly recovered to shut down the Iowa offense. Jake Collins coolly converted the first extra points of his career. Obviously, the players themselves made the plays. But no one seemed spooked after being thrust into an unfamiliar, high-stakes position, and NU’s confidence never wavered after falling behind in the third quarter. Players from the offensive backfield to the defensive backfield raised their level of play, just as Kirk Ferentz’s Hawkeyes did not. As a result, Fitzgerald has the division title he so frequently parrots as his goal. The ugly losses to Duke and Akron make for cool trivia about teams who win a division title but no nonconference games. That’s about it. Fitzgerald’s abilities, however, came into play shortly after those defeats. Entering October 1-3 and with no semblance of a running game, the Cats handed No. 20 Michigan State a 10-point defeat. NU faced adversity as broad as Lake Michigan, then suddenly looked like it could walk on water. That’s a theme. A reeling 2016 Cats team turned its season around with consecutive upset wins at Michigan State and Iowa, turning a lost campaign into a bowl-eligible one punctuated with a memorable Pinstripe Bowl upset of No. 23 Pittsburgh. Last year, NU took itself out of division title contention early, but ran off eight straight wins — including three straight in overtime — to cobble together a 10-win season. Those campaigns ended in bowl victories, one of Fitzgerald’s three prominently stated on-field goals. This year, the coach one-upped himself, and got the Cats to a second goal. And the elusive third goal, winning a Big Ten title? That will be decided in the most significant game of Fitzgerald’s coaching career.